The U.S. Securities and Exchange Commission (“SEC”) brought charges against Avalon FA Ltd (“Avalon”), a Ukrainian trading firm, for committing fraud in the U.S. securities markets. The Commission also charged a New York broker-dealer with fraud for knowingly aiding and abetting Avalon with the market manipulation scheme. In its court Complaint, the SEC accused Avalon, the Ukrainian firm, of blatant market manipulation. Specifically, the Commission cited Avalon’s openly promoting itself as one of the few trading firms that still permitted “layering”. The SEC alleged that Avalon conducted its layering scheme in U.S. securities from approximately December 2010 until at least September 2016. Layering occurs when a trader places false orders to purchase or sell a security with no intent to actually consummate the trade. Rather, the trades are entered with the intent of creating fictitious supply and/or demand in a security in order to increase or decrease a security’s trading price. Once the price is manipulated to the trader’s desired target, the trader executes trades opposite of the false or “layered” trades for a profit. The trader then breaks (does not execute) his or her disingenuous original order. The SEC alleged that during the aforementioned period, Avalon conducted hundreds of thousands of layered trades in countless securities, providing the firm with more than $21 million of illicit profits. The SEC also accused Avalon of conducting a second fraud scheme called “cross market manipulation” between roughly August 2012 and December 2015. Per the Complaint, Avalon intentionally bought and sold U.S. securities at a loss, in order to artificially manipulate the prices of those securities, so that it could then reap significant profits from options it bought against those securities. The Complaint asserted that Avalon’s purchases and sales were made for no other reason than to manipulate the market, in order to improve the execution price of the corresponding options. The sales prices on those options more than made up for the losses that Avalon incurred on the direct stock trades. Avalon was accused of generating over $7 million from its cross-market manipulation scheme. 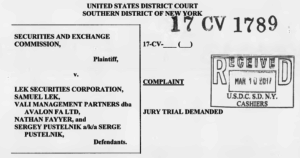 The SEC also charged Lek Securities (“Lek”), a U.S. brokerage firm, with aiding and abetting Avalon by knowingly providing Avalon with a platform to access the U.S. securities markets and through which to conduct its market manipulation schemes. The Commission alleged that not only was Lek aware of the illegal activities of Avalon, but also sanctioned the cross-market trading scheme and reduced its own layering compliance controls to assist Avalon. Lek purportedly went so far as to upgrade its trading systems to improve Avalon’s ability to execute its manipulative trades and fulfill its schemes. As alleged in our complaint, Avalon openly marketed itself as a destination for manipulative trading, and Lek Securities opened the gate to allow the schemes into the U.S. markets despite repeated warnings that its customer was manipulating the market. In addition to Avalon and Lek, the SEC filed fraud charges against Avalonʼs owner, as well as a registered representative for Lek who failed to disclose that he held a controlling interest in Avalon. The Complaint also charged the owner of Lek Securities with aiding and abetting the frauds and violating Section 17(a)(3) of the Securities Act. This case illustrates some types of misconduct that could give rise to SEC whistleblower cases if reported to the Commission through the SEC whistleblower program. However, SEC has not made any public statement as to whether this case was itself an actual SEC whistleblower case. The SEC Office of the Whistleblower posts Notices of Covered Action (“NoCA”) for Commission actions where a final judgment or order results in monetary sanctions exceeding $1 million. The NoCA list does not disclose if a particular Enforcement action was brought as the result of an SEC whistleblower case, tip, complaint, or referral being filed with the Commission.